Usher’s Island is the ugliest place in Dublin city according to research that will be presented at a Royal Institute of the Architects of Ireland (RIAI) conference in Dublin today. The top three prettiest places in the centre of Dublin are the south Georgian area, the east end of Portobello, and Blessington Basin, in the north inner city. The ugliest are the Usher’s Island-Bridgefoot Street area, Cork Street and the Coombe, all in Dublin 8. 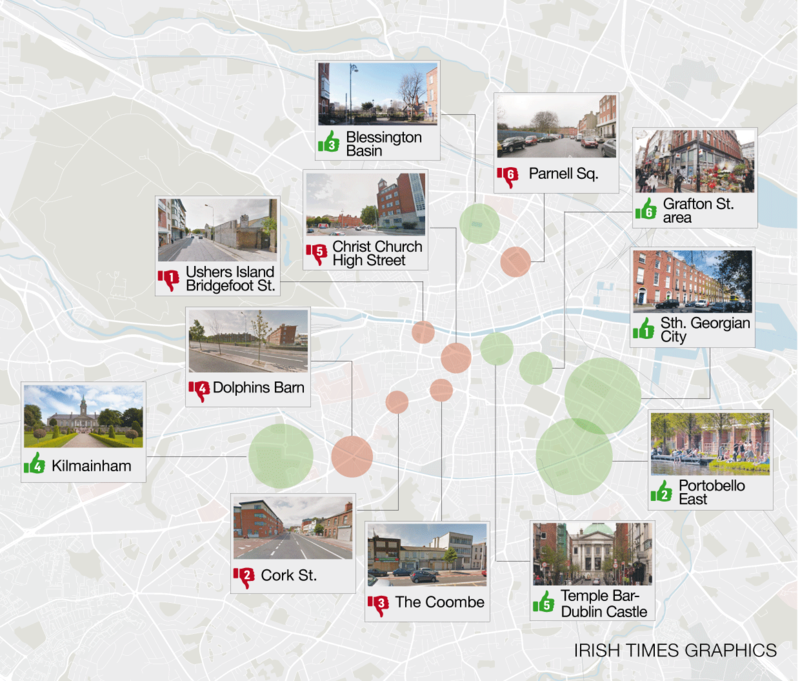 The analysis by architect Motti Ruimy and urban planner Paul Kearns, authors of Redrawing Dublin, is part of the Mapping Beauty project in collaboration with the School of Geography UCD, which aims to determine how Dublin streets can be made more beautiful and more desirable places to live. Neighbourhoods within the city centre area bounded by the Royal and Grand canals were judged by five criteria: the amount of vehicular traffic; the percentage of land zoned as open space; the amount of vacant/derelict land in the area; the number of protected structures; and the number of street trees. Mr Kearns explains the use of neighbourhoods rather than individual streets means that while people may have “favourite” eyesores and blackspots, the surrounding areas had enough trees or green spaces, or were less choked by traffic, to keep them off the bottom. “If it were just streets, Summer Hill, or along the Luas Red line would probably feature, but these areas have a number of quieter back streets and the presence of some parks, while a high level of vehicular pollution drove down the Christ Church-High Street area . . . Also the analysis doesn’t capture ugly buildings or litter”. The research aims to start a conversation about how to make densely populated areas more beautiful, and beautiful areas more dense, he said. Socially or economically vulnerable people, particularly those living in very small apartments in high density neighbourhoods are more dependent on the immediate quality of their street, Mr Ruimy said. The RIAI and Academy of Urbanism conference Urban Futures Cities & Towns in Transition runs on Thursday and Friday in Dublin Castle. Hawkins House to be knocked, but what about its ugly neighbours? Olivia Kelly: Why can’t we save O’Connell Street?